Supplied as a pack of 3 bare root plants, plant at soil level in autumn or spring. Without doubt, one of the most impactful and beautiful perennial plants you can grow, the simply huge and striking two-tone flowers of Peony 'Bowl of Beauty' are a Spring joy to behold. Peonies are bang on trend at present, and make great flowers for the vase too - cut when the buds are just about to pop. As seen in all the top florists! Depsite their looks, they are very robust and weather proof - needing perhaps a little support when mature in exposed spots, as their flowers are just so big - up to 25cm (10in) across when open. They establish slowly into large clumps over years, if not decades, to create a real feature. Grow in garden soil, in most spots, but avoid very boggy or very sandy, and fertilsie well when they grow. New shoots emerge quickly in late March, and flower in May and June. In late Summer, they die back under and are dormant - the best time to lift and transplant. Hardy, easy, spectacular, - a real Bowl of Beauty for sure. Supplied as a pack of 3 dormant bare roots, to plant straight out in garden border in Autumn or early Spring. 2-3 nose roots. 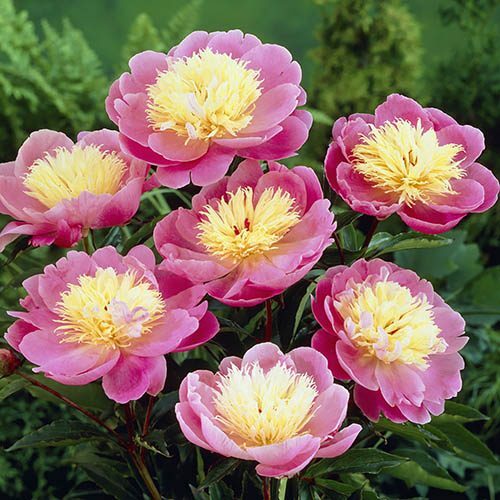 Be careful not to overwater newly planted Peonies, especially those that have been planted into decorative pots rather than the ground. They are best kept slightly on the dry side!